I need yet more long-sleeved tops to wear at work. I love button-down shirts, but sometimes it's nice to be a little more comfortable. McCalls 6435 has been on my list for a while. It has long, short, or 3/4 sleeves (and I see no reason you couldn't turn it into a tank). The bodice either has a sweetheart top with a yoke, or an asymmetrical yoke. You can pretty much mix and match - which means you can use the same pattern a bunch of times without looking like your clothes came from a 5 for $20 sale. For my first version, I used two poly/ITY knits that were of about the same weight. For the asymmetrical pattern, I think this will minimise weird ripples along the seamline. The nice thing about a pieced pattern like this is that you can essentially use remnants - great for the wallet, and great for the environment. I didn't use the instructions. Basically you piece the front and back, then sew up the shirt. McCalls has you set in the sleeves after the sides are sewn up... I didn't and wouldn't do that. 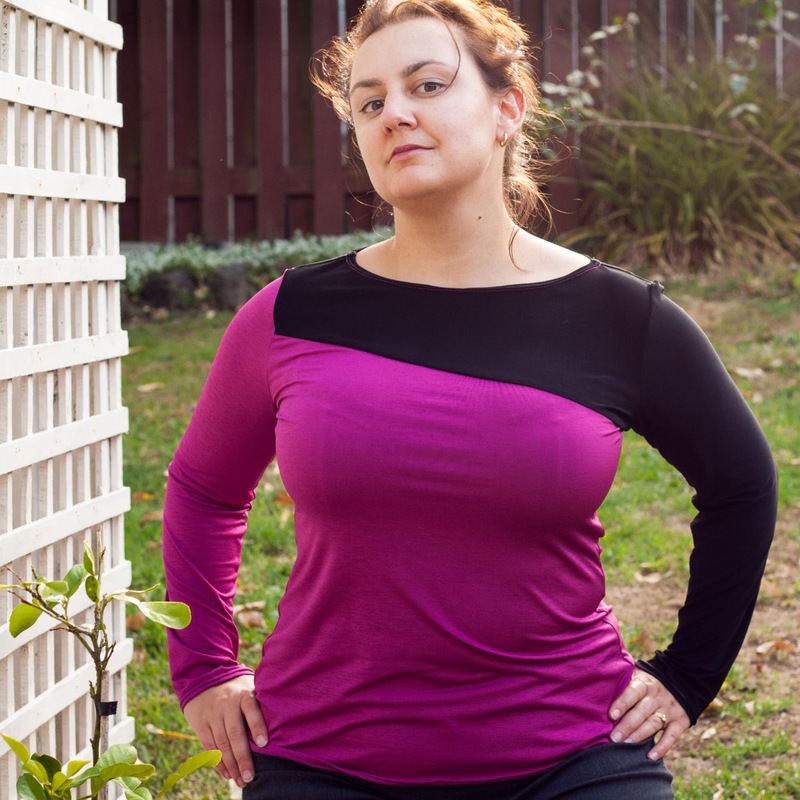 Setting in sleeves to a knit t-shirt usually ends in ugly shoulder gathers. I suggest sewing in the sleeves flat, then sewing up the side seam all the way to the wrists. This also means you can hem the wrists first, if you don't have a free-arm on your sewing machine. I think this is a great basic. I didn't make any FBA, despite usually needing one. If I used a more stable knit, I would probably have to. But I'm happy enough with this fit. Being a knit shirt, it's only a few hours (max) from cutting to finishing. Great top - love the asymmetrical look - great way to use up your bit of fabric too. Must try this. Yes, I like to use up fabric scraps, but I don't usually know what to do with them. I'd love to see your version, if you make one. It looks great! I love the use of two colours, plus you can't go wrong with an unintentional homage to Star Trek! P.S. Your name/URL commenting option seems to have fallen off, as well as your lovely background photo. Is blogger having some problems tonight? I'm not a Star Trek fan at all, but I also like dual colours! This looks cute- and well fitting! I need to get around to sewing up some more basic shirts. Thanks Megan! I often get carried away wanting to sew 'exciting' things, but it's good to make basics to wear every day (probably more rewarding, really). It is a REALLY good pattern, especially with the variations. I mean, you could even make the yoke and front/back as one piece, and just have a plain t-shirt. It looks amazing! And the fit is really good too. This would probably help my determine which way is left or right when driving. Seriously, i get them confused all the time. I'm thankful for the fit validation! I love this! The color combo is perfect! Thank you! I'm trying to steer clear of plain black and grey (which was my habit for many years).